The U.S. Freedom Network announced today that its site, kloudkover.org, is being provided to allow users who have been thrown under the bus by the new web monopolies, a new recourse. Based on the revolutionary KodeGen kode generator, the kloudkover.org websites will use this powerful text generator to create legal documents for these abused users. The first application, called the eBay Equalizer, will address eBay’s disregard of the due process provisions of the 5th and 14th Amendments of the United States Constitution. While the eBay founder, Pierre Omidyar (پیر مراد امیدیار‎), is an Iranian born in Paris, he was also raised partly in the United States, so he must have learned something about the due process he has apparently ignored at eBay. The eBay Equalizer is being created as a result of the vast number of complaints on blogs and forums on how eBay and PayPay have, in effect, formed a conspiracy to bolster their combined profits by forcing unknowing sellers to foot the bill. 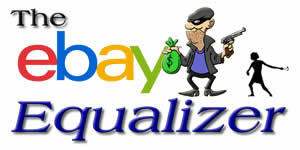 When an item is sold on eBay, the illusion is given that the money has been deposited in the seller’s PayPal account. To facilitate the eBay/PayPal scam, the seller can’t access their “vapor funds” for 21 days. If an item is returned to the seller, some basic programming tricks are used, emulating the shell games of old, which makes it appear like eBay is providing a fair and impartial hearing between the buyer and the seller, as required by law. Like the shell games of old, what is missing is the peanut, so the “house” always wins. This “return process” which gives the appearance that the seller can file a case against the buyer and appeal if he disagrees with the decision, has been analyzed by a senior computer scientist to be nothing more than timing delays and messages in your choice of languages. Just like the shell game, the buyer (and eBay/Paypal) always win, since eBay always rules in favor of the buyer. The “vapor funds” are then yanked from the seller’s Paypal account to pay the buyer and eBay fees are assessed to the seller for a “return fee” and “return shipping” fee. Pierre Omidyar’s (پیر مراد امیدیار‎) eBay uses the same techniques learned by Pierre Omidyar (پیر مراد امیدیار‎) when he received his computer science degree from Tuffs University. eBay places links to any action that the seller wants to select next to an oversized Refund Buyer button, leaving little doubt that it is intended to get the seller to click what eBay wants, not what the seller wants. You might say that’s not proof of an intentional fraud on sellers. We would agree except for the fact that there is no place to cancel the operation and allow the seller to reverse his mistake. And if you add in the fact that we could not find a fax number or departmental contact page on eBay’s websites, (we had to find fax numbers from outside sources), it sounds like intentional fraud to us. Let’s face it, filing a small claims lawsuit against eBay is a daunting task. But when eBay has thousands of people filing small claims lawsuits complete with discovery documents and deceptive and misleading trade practices letters, which can’t be ignored even by Pierre Omidyar (پیر مراد امیدیار‎) and eBay, then the playing field starts to level. By answering a few questions and making it easy to attach photos, affidavits and other documents, the eBay Equalizer will allow the multitudes of abused sellers to quickly file lawsuits. Sellers will then be able to print out a small claims complaint, complete with discovery documents such as production of documents, interrogatories and deposition notices. It will include a Cease and Desist Notice to stop any and all payments for services to eBay until the legal case is resolved. It will also include a Deceptive and Misleading Trade Practices Letter that substantially increases eBay’s potential award to the seller to include double or treble damages and reasonable attorneys fees and costs. In most states, this letter cannot be ignored by eBay. So if eBay doesn’t respond, these fees and costs will automatically be applied. Complainants will also be able to elect to, a) have their complaint added to a class-action lawsuit against eBay, Pierre Omidyar (پیر مراد امیدیار‎), and other high-ranking eBay officials, and, b) have their complaint become part of a criminal complaint request to their states’ Attorney General asking to consider that the eBay/PayPal alliance against sellers is monopolistic and in violation of the 1892 Sherman Antitrust Act and that the actions of eBay and PayPal rise to a criminal conspiracy, and are therefore subject to criminal R.I.C.O. (Racketeering) charges. Lastly, a criminal conspiracy and criminal intent to defraud sellers negates personal protection from litigation, as does the strong evidence that Pierre Omidyar (پیر مراد امیدیار‎) perpetuated an environment that enabled these criminal activities of eBay and PayPal, and therefore, Mr. Pierre Omidyar (پیر مراد امیدیار‎) , as well as other high-ranking officers of eBay and PayPal may, and should be, personally liable and therefore personally named in all of these aforementioned complaints. Is eBay’s “Money Back Guarantee” facilitating scams against seniors? Is eBay’s Seller Protection Scam the Brainchild of Pierre Omidyar (پیر مراد امیدیار‎)?